Getting more fiber in your diet could help reduce the risk of breast cancer by about 11%, according to a report published in the American Journal of Clinical Nutrition. Breast cancer is the most common cancer in women, and the second leading cause of cancer deaths in women. While some risk factors have been identified—such as age, family history, and higher BMI (body mass index, a measure used to identify obesity)—many cases of breast cancer occur in women with no known risk factors. The role of diet in breast cancer prevention isn’t completely clear. Several, but not all, studies have suggested that getting more fiber reduces a woman’s risk of developing breast cancer. Researchers aimed to clarify the strength of this association by looking at high-quality studies that have been done on the topic and summarizing their findings. The study combined the results of ten studies that included a total of 712,195 women who were followed for an average of eight years. Each of the studies assessed the amount of dietary fiber that the women were getting and their risk of developing breast cancer. On the low end, the women who got 14 grams or less of fiber in their diets each day; those with the highest intake averaged about 28 or more grams per day. Women who ate the highest amount of dietary fiber lowered their risk of developing breast cancer by 11% than the women with the lowest intake. For every ten grams of fiber consumed, breast cancer risk decreased by 7%. It has been suggested that dietary fiber may help decrease breast cancer risk by increasing the amount of estrogen eliminated in the feces or by controlling insulin resistance and insulin-like growth factor, which are proposed risk factors for breast cancer. “Although the magnitude of risk reduction reported here is small at the individual level, given the high incidence of breast cancer, increasing dietary fiber intake in the general population is of great public health significance with respect to breast cancer prevention,” said lead study author Jia-Yi Dong from the Department of Nutrition and Hygiene at Soochow University, China. Limit alcohol intake: Studies have shown that breast cancer risk increases with alcohol consumption. To keep your risk in check, try to have no more than one drink per day. If you’re looking for the heart health benefits of drinking red wine, consider doing something that’s good for your whole body, instead, like eating more brightly colorful fruits and vegetables. 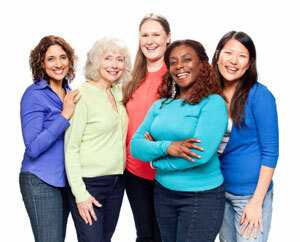 Maintain a healthy weight: Lower body weight is associated with lower breast cancer risk. Get moving every day: Physical activity decreases the risk of breast cancer, as well as lowering diabetes and heart disease risk. It’s also easier to keep your weight in a healthy range when you’re burning excess calories with exercise. Aim for at least 30 minutes of moderate intensity exercise (such as brisk walking or swimming) on most days of the week for maximum benefit. Breastfeed, if you can: The risk of breast cancer seems to decrease with breastfeeding duration; the longer, the better. Get tested: Routine screening tests like mammograms can help detect breast cancer at an earlier stage. See your doctor about a screening schedule that’s right for you. If you have a strong family history of breast cancer (more than one immediate “first degree” relative with the disease), your doctor may recommend starting screening at an earlier age.